Adopting multi bore filling, intermittent operation and frequency control, the automatic capsule filling machine can complete capsule feeding, separating, filling, locking, and finished product output for power and pellet capsules. International famous brand of bearings and electrical devices are adopted, enabling the machine to run at high speed and perform stably. The fully enclosed ten-position turntable has characteristics of high precision, low noise, strong applicability to domestic capsules, etc. Components contacting medicine are made by stainless steel and dust exhaust apparatus is attached, meeting requirements of GMP. 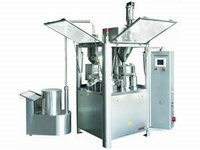 We have improved the design of the automatic capsule filling machine, making it perform better. Enlarged cam mechanism is adopted, making our company the only enterprise using RU100 and RU83 cams. This increases costs, but stability and service life of the machine are greatly improved. Internal design of the mold turntable is also modified. Our machine adopts 90 original Japanese beeline bearings which ensure precision of the machine. The dosing disc is enlarged by 3cm, making powder flow evenly and filling dose accurate. This machine adopts three-dimensional adjusting mechanism, eliminating deformation of dosing disc and copper saucer, reducing power leaking and facilitating cleaning. Because of the above modifications, this machine is 9cm wider than the other similar products. 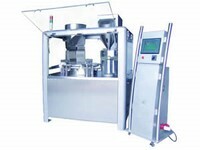 This automatic capsule filling machine adopts capsule vacuum positioning mechanism, leading to 99% capsule filling rate. A capsule control switch is added outside the machine, which is safer and more convenient. 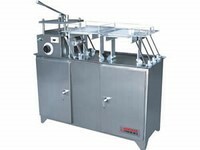 Our product is also equipped with an inching control system, facilitating operating and cleaning. As a professional automatic capsule filling machine manufacturer and supplier in China, we also offer high efficiency poreless tablet coating machine, high speed blister packaging machine, horizontal cartoning machine, automatic medicine packaging production line, and much more. Manual Capsule Filling MachineImproved on the basis of traditional capsule filling and locking machine, the manual capsule filling machine has higher arraying speed and lower power consumption, and is more efficient. It is suitable for the filling of #00, #0, #1, #2, #3 capsules, powder, pellets and objects with high viscosity. Our capsule filling machine adopts variable frequency speed regulation and runs stably. Semi Automatic Capsule Filling MachineIntegrating mechanics, electronics and air, the semi automatic capsule filling machine can complete capsule feeding, separating, filling, locking and other operations. 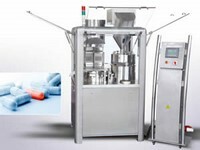 It is applicable to capsule filling of powdery and granular drugs or health care products. 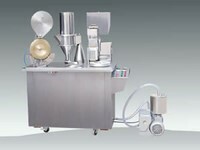 The machine and working table are made by stainless steel, which meets sanitary requirements of pharmacy.